Military History Society of Ireland, Griffith College, South Circular Road, Dublin 8. Robert the Bruce’s Irish wars, Seán Duffy. Galway Archaeological & Historical Society, Harbour Hotel, Dock Road. Galway in 1916—a pictorial review, Paul Duffy + AGM. Skerries Historical Society, Keane’s Lounge, The Bus Bar, 8 Strand Street. The Howth gunrunning, Gerry Byrne. Social conditions in Dún Laoghaire during 1916, Pádraig Yeates. Enniskerry History Society, Powerscourt Arms and Country House Hotel. Tales of Enniskerry, Brian White. Adm. €3. Foxrock Local History Club, Pastoral Centre beside Foxrock RC Church. Irish Victorian mountaineers, Declan O’Keefe; What the ordinary people ate in ancient times, Liam Downey. Adm. €5. Royal Irish Academy/University College Dublin, RIA, 19 Dawson St.
1916 and the Great War, Jay Winter. Dún Laoghaire–Rathdown 1916 Committee, Marley House, Rathfarnham. Bray Cualann Historical Society, Kinsale Room, Royal Hotel. AGM + The Irish National Foresters, May Harte. Adm. €4. Greystones Archaeological & Historical Society, Holy Rosary Family Centre. Robert Tressell, Dubliner: author of The ragged-trousered philantrophist, Bryan MacMahon. Clondalkin Historical Society, Áras Cronáin, Watery Lane. Dan Donnelly: Irish boxing champion, Larry Breen. Gordon Brewster: a local artist’s life and times, Pól Ó Duibhir. Deansgrange Cemetery and its association with the Rising, Jamie Moran. Rathmichael Historical Society, Rathmichael NS, Stonebridge Road. Revd Thomas Goff of Carriglea, David Doyle. The Dún Eimear Gaelic Revival, Eimear O’Connor. Engineers Ireland Heritage Society, 22 Clyde Road, Dublin 4. Artillery in Ireland from the Armada to 1800, Harman Murtagh. Eoin MacNeill and 1916, Mary Harris. The South Circular Road on the eve of World War I, Catherine Scuffil. Military History Society of Ireland, conference in association with Irish Military Archives & the National Museum of Ireland, Collins Barracks. Sackville Street, the Somme, Salonika: Irishmen and women at war in 1916. Castletown House, Celbridge, Hunting Room, Stable Wing. Through peace and war: Kildare County Council in the years of revolution, Tom Nelson. Maynooth Local History Group, Geraldine Scout Hall, Leinster Street. Major Patrick J. Colgan (1890–1960), Comdt, North Kildare Battalion, IRA—an underplayed Maynooth veteran of 30 years’ military and public service to Ireland, John Colgan. St Enda’s, Rathfarnham, Eanna de Burca; Walter Osborne, Una O’Callanain. Adm. €5. The Sherwood Foresters from Dún Laoghaire to Mount Street Bridge, Billy Campbell. Lifeboats of Wicklow, Ciaran Doyle. Adm. €4. Hedge Schools of Wicklow, Tommy O’Rourke. Revolution & Counter-revolution, UCD School of Sociology seminar, Geary Seminar Room, Belfield. 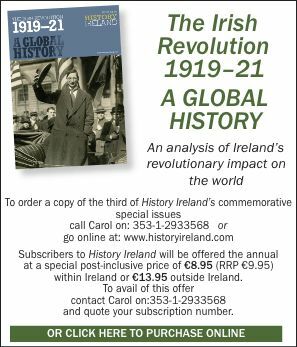 Patrick Pearse, director of military organization of the Irish Volunteers?, Ruan O’Donnell; Why was James Connolly involved in the 1916 Rising?, Kieran Allen; Was there a revolution in the wake of 1916?, Conor Kostick; 1916 from Dublin to Central Asia, Ozgecan Kesici; The 1916 Provisional Government and ‘provisional democracy’ as a historical problem, John Regan; Women of the Irish Revolution, Liz Gillis. Dublin City Library and Archive, 138–144 Pearse Street. Local history society group day—four lectures. Eoin MacNeill: scholar, nationalist, revolutionary, parliamentarian, Michael McDowell. Rathborne tallow chandlers, Bernard Neary. Roundwood Historical Society Seminar on 1916, Parish Centre. Nationalism 1603–1905, Kevin Whelan; Women and 1916, Mary McAuliffe; Nationalism 1905–1916, Eunan O’Halpin; James Connolly and the Left, Pádraig Yeates; History Ireland Hedge School, The 1916 Proclamation: then and now, Robert Balagh, Eunan O’Halpin, Pádraig Yeates, Margaret Ward. Tickets €20, +353 (0)1 2818146, mon.farrell@gmail.com. The Kildare connection to the Easter Rising 1916, Seamus Cullen.